Much of the week was spent finally getting round to doing a much needed update to Kennedy, my app for capturing the now. Since iOS 12 came out there's been a weird bug that caused the app to crash whenever you tried to add or edit a note. After some delving into the code and much Googling and Stackoverlowing (is that a verb?) I managed to execute this fix to do with afanalytics. Of course once you open up old code it can reveal a few other things to fix, which it did, namely the photo editor needed replacing as Aviary was bought and then shut down by Adobe. In the end I went with DS Photo Editor and after some customisation it looked good and worked very nicely. Shame I couldn't change the typeface but just something I have to live with right now. The Trend Micro work went live at the RSA conference in San Francisco, so I could finally add it to my site and post it to Instagram. Have to say the feedback has been really nice, with it being my most commented on piece of work for quite a while. I've also been continuing to work on this title sequence project though I've not really been feeling it this week so I've been distracted elsewhere. Sometimes it's good to step away from things and then revisit them anew, almost like getting reacquainted with someone or something again. I find there's always something new from that interaction. 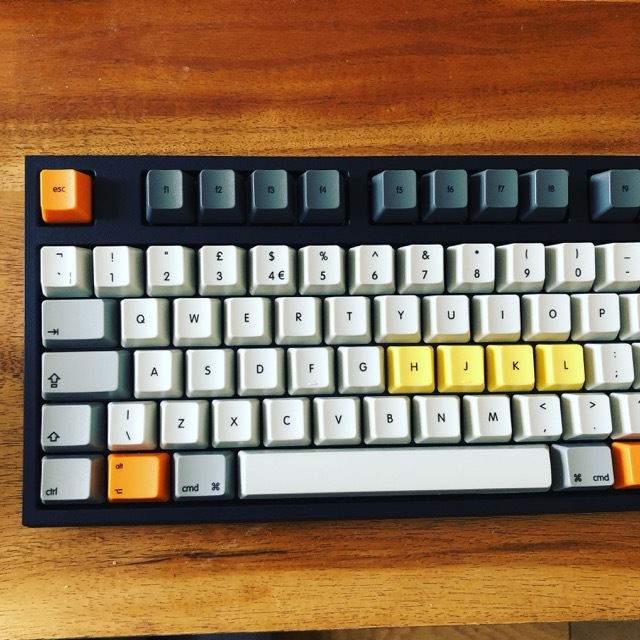 On the Wednesday UPS delivered my new mechanical keyboard from WASD, complete with custom colors, especially made for using Vim. Have to say having been through many mechanical keyboards over the years — including the famed Apple Extended Keyboard II — this is by far the best I've ever used, With the Cherry MX clear switches in place it still has that nice click but it's not overly loud. I did however have to switch my keyboard settings to British PC as the @ sign and the " keys were switched. Other than that, it's perfect. Just as I was about to submit the redone version of Kennedy to the App Store on Thursday I noticed that Weather Underground had finally killed their API after being bought by The Weather Channel. There's a pattern here. Anyway, after some looking around for an alternative I found Open Weather. After some fiddling with the code I finally submitted this new version of Kennedy to the App Store for review. I woke up on Friday morning to find news that Kennedy had been approved and was now updated on the App Store. Wish I had done it sooner.